Voakes Free From is the gluten and wheat free range from Voakes Pies. 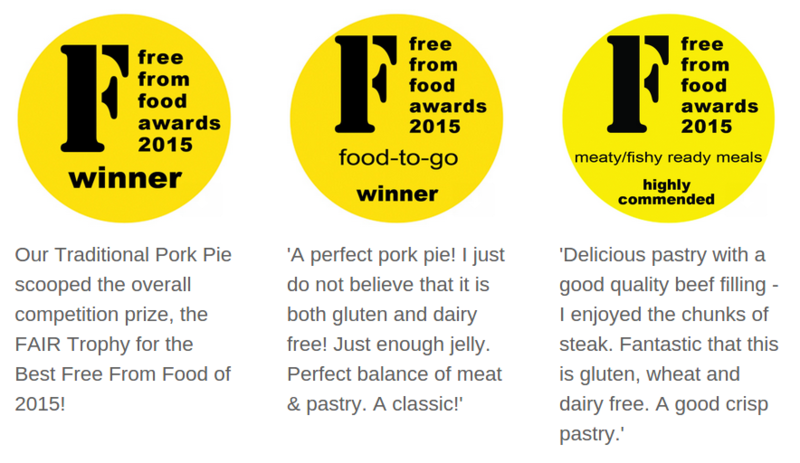 The gluten free products are made using the same finest quality pork and meat that Voakes Pies are renowned for, to bring you the taste you love, without the gluten. The range has been developed by expert pie maker Andrew Voakes’ son Nick and his partner Laura. Their passion for producing the range stems from Laura’s diagnosis in 2011. This presented the prospect of Laura never being able to eat a Voakes Pie again, and a solution had to be found! Voakes pork pies are produced from the family’s stock of pigs which are bred exclusively at Whixley Grange. The pies are produced using only the finest cuts of pork and high quality, carefully selected ingredients. The production unit for Voakes Free From is purpose built, providing a superb quality controlled environment in which high standards can be maintained. It is a dedicated gluten and wheat free environment. Nick & Laura are constantly working on the development of new products to cater for all diets, the latest being the new vegetarian range, which includes 4 vegan friendly products. We attend Gluten free Food Fairs across the country. Please contact us If you have any questions or queries regarding our products.